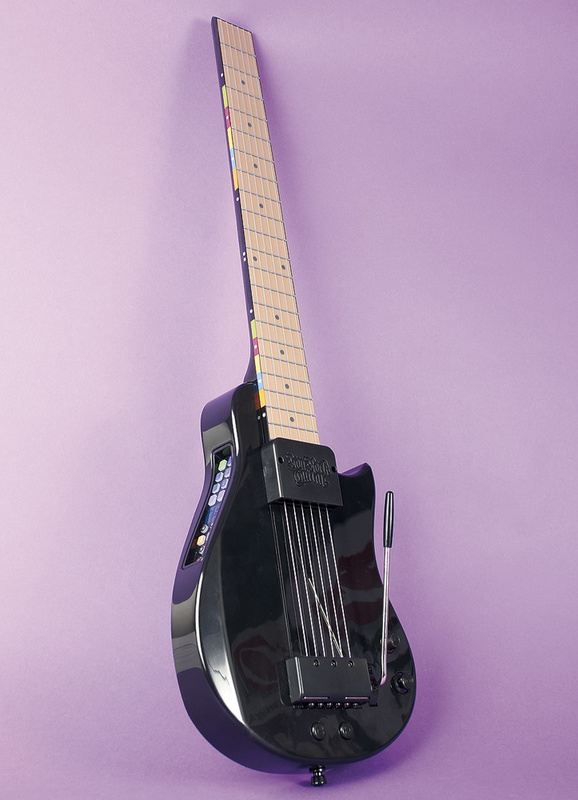 It looks like something that should be plugged into a games console, but Inspired Instruments' You Rock Guitar just might be the MIDI guitar controller you've always wanted! If you are wondering what Sound On Sound is doing reviewing a 'games controller', rest assured: the You Rock Guitar appears in these pages for the best of reasons. Forget the cheap 'plasticky‑ness' of its looks; forget, if you can, the dorky name and that fact that it outputs circa‑1987 on‑board synth and 'guitar' sounds; forget the fact that it will allow you to record your 'no‑wrong‑notes‑allowed You Rock Mode' performances over its in‑built backing tracks to an internal sequencer — those are all features for a different type of user. If you can look beyond all of that, what you will see is the affordable, practical MIDI guitar controller that someone should have produced years ago, but which nobody quite did. The You Rock Guitar's designer, and the man behind the company, Cliff Elion, is actually a MIDI guitarist who set out to create a simple but effective MIDI guitar controller, but made sure it also had a more mass‑market application to help make it affordable. And he's succeeded on both fronts: it's highly affordable, at £129$219, and it works well enough as a MIDI controller to be a worthwhile investment for any guitar player who wants to be able to get notes into a DAW without having to acquire keyboard skills. The YRG (their abbreviation) uses 'virtual' strings moulded into the surface of the neck. These detect finger pressure at the 'frets' in order to determine the pitches of notes, whilst a shorter set of 'real' strings under the right hand generate note‑on and velocity data. Fundamentally, it's a bit like the Starr Labs Ztar I reviewed in SOS March 2011, but with virtual strings in place of buttons, simpler software and fewer controller options. What you've got on the YRG is what you'd expect to find on any small keyboard controller: program Inc/Dec buttons, a volume control, a mod wheel and a pitch bender (up to ±12 semitones), which is implemented here in the form of a guitar 'tremolo' (vibrato) arm. 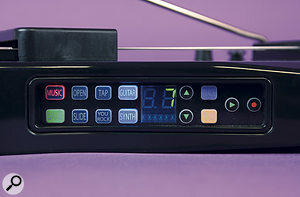 Much of the control panel is redundant when the instrument is used as a MIDI controller, but you'll want to be aware of the Tap mode, which outputs notes as soon as they are 'fretted' in the left hand, without requiring a string trigger note, and also Slide, which converts hammer‑on notes to pitch bends, provided that the interval matches the one selected in the control software. Because there's no pitch‑to‑MIDI conversion involved, output is as instantaneous as a keyboard and as clean as your playing ability on a narrow, plastic fingerboard with fake strings and frets will allow. Slow single notes are easy; simple chords are easy, but fast runs and transitions between complex chords can start to generate a bit of spurious note data. The temptation to tweak sensitivity and velocity scaling is immediate, and tweak you can, thanks to a comprehensive software editor available as a download from the well‑appointed www.yourockguitar.com web site. You can in fact access everything in the OS from the control‑panel buttons alone, but you wouldn't want to, unless you are one of those strange people who do actually miss programming a six‑operator FM synth with just a data‑entry slider. There's all kinds of clever stuff you can do using the fretboard for data entry too... but I don't, and I suspect you won't either, when there is a software alternative that makes the job so much easier. The software editor allows you to adjust overall sensitivity and individual string gain to help find a consistent playing feel that generates the least amount of doubled or unwanted notes versus dropped or missed notes. You also have a choice of seven velocity scalings, from fully linear all the way up to fixed. For all the software adjustments on offer, however, the most important playing parameter as far as my own experience was concerned is one that can be adjusted with a screwdriver: I found that reducing the tension of the right‑hand 'plucking' strings made a huge difference to my ability to access the full range of velocities, and to feel in control of how notes would sound. Perhaps those who play with a plectrum would need a tighter setup, but I like to play MIDI guitars with (right‑hand) fingers in order to generate more keyboard‑like voicings, and using the tension screws at the base of the tailpiece to reduce the strings to an almost unpitched state of floppiness was the key to getting the best out the instrument for me. YRG can be battery powered, but if you are using it as a MIDI controller, it is almost certainly going to be connected to a computer running DAW software, so you'd be able to take advantage of a single‑wire USB connection (Mini‑B type on the guitar) to both power it and output MIDI. There's also a conventional five‑pin MIDI output, a quarter‑inch audio output for the on‑board sounds, and mini‑jack headphone output and audio inputs. Whilst the instrument has a conventional 25.5‑inch 'scale length', the fret spacing has been stretched a little at the upper end to increase playability, while the lower few fret positions have been compressed. Nevertheless, the spacing is close enough to normal to not be at all disruptive. The absence of a headstock means that first position isn't where you instinctively expect it; actually, you can get a headstock as an optional add‑on, but personally I find the headless format useful on MIDI guitars as it allows you to use chord fingerings that would otherwise be physically impossible. The You Rock Guitar's onboard connections include a MIDI Out socket, USB port, quarter‑inch audio output and 3.5mm audio in and headphone sockets. A Tap function allows you to trigger notes without picking them at all with the right hand (although the string triggers remain active as well), but you've only got one note per string available (unlike the fully polyphonic Ztar neck). You can also generate an automatic string‑bend effect by activating the Slide function, which uses pitch‑bend messages to generate new pitches without an attack phase when notes are fretted on a 'string' that is already sounding. Slide only works over the interval set in the software (from a semitone to an octave), so attempting a Slide note of any other interval with Hammer Enable switched off will produce no output. If you are new to MIDI guitar, you might be wondering why you'd want to turn off the ability to hammer‑on to notes as it is such a fundamental part of most players' technique, but it is a double‑edged sword in a MIDI context. Guitarists use hammered notes to achieve flowing, legato lines, but they also frequently pre‑fret notes prior to picking them, and MIDI‑guitar operating systems have no way of knowing which is which, resulting in a high probability of doubled notes being output. For simple parts, you can ensure a cleaner MIDI output by requiring every note to be both fretted and picked before it will be output. The YRG software offers an 'exclusion window', designated Hammer Pre‑Delay, during which hammered notes will not be output, while the OS waits to see if there will be a picked note as well. Although the parameter goes up to 127, you'll start to notice a slowed response on hammered notes anywhere into double figures — I run it at about 14 and find it a compromise well worth putting up with for the cleaner output it generates. Hammer‑On Decay determines whether hammered notes have the velocity of the note that preceded them or some lesser proportion of it — this is a 0‑20 parameter, and I tend to have it set quite high, at 13, giving an obvious difference between picked and hammered notes, but without making musical lines sound uneven. 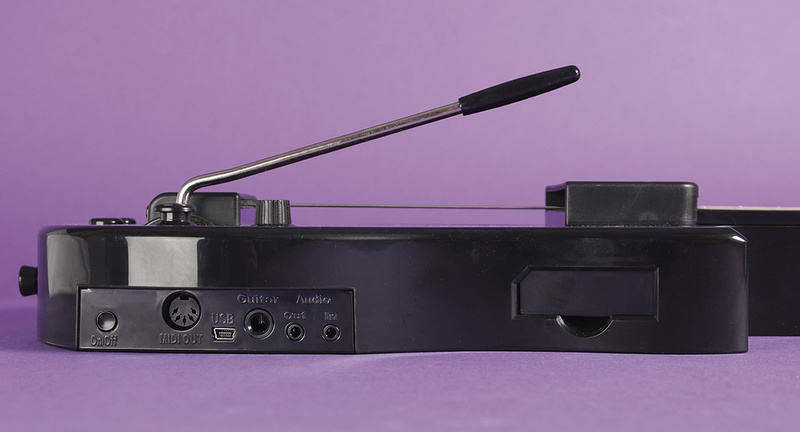 With no actual physical vibrating strings to use for damping, guitarists' normal way of stopping notes from sounding has to be replicated in software: YRG offers an all‑notes‑off damping bar at the base of the tailpiece and an Auto‑Silence Open Strings function that automatically shuts off any open‑string notes if you take both fretting and plucking hands away from the instrument. This is not to be confused with the Open String Damping function (just On or Off, rather than a variable), which makes open‑string notes slightly harder to provoke into action, the theory being that these are easily triggered accidentally when playing higher up the neck. In practice, I find this just makes open‑string notes slightly frustrating during normal playing, whilst failing to fully suppress unwanted open‑string notes, and I would prefer to have at least the option of a full Open‑String Off mode, for occasions when you know that the part you are attempting doesn't require them. A Crosstalk Filter can be activated to help suppress unwanted notes due to vibration being transmitted to adjacent strings during the picking/plucking process. This mainly seems to occur when the strings are at the higher tension setting the instrument ships with, and I was able to disable it with no ill effects with my preferred low‑tension setup, but I'm unsure whether doing this actually confers any low‑level sensitivity advantage. Entire YRG setups, including on‑board voices, transpose setting and velocity table, can be saved as presets, although the majority of functions that are important for use as a MIDI controller are actually global and will apply across all presets. YRG can transmit on any single channel, like most keyboards, or in a channel‑per‑string format like pitch‑to‑MIDI systems, which allows it to both address different voices on different combinations of strings and to work with synths that have been set up for pitch‑to‑MIDI without re‑channelisation. There's a library of on‑board tunings that I initially dismissed as just belonging to the on‑board sounds, until I discovered that they affect the MIDI output as well. This opens up some really good creative possibilities, particularly in forcing you to get away from the typically 'guitaristic' chord voicings that rarely sound right with synths and traditional keyboards like pianos and organs. A chorused Rhodes in DADGAD was a particular delight; a 'Michael Hedges Bb add 2 sus 4' Hammond less successful, but used with taste and discretion, the alternate tunings are a great creative option. 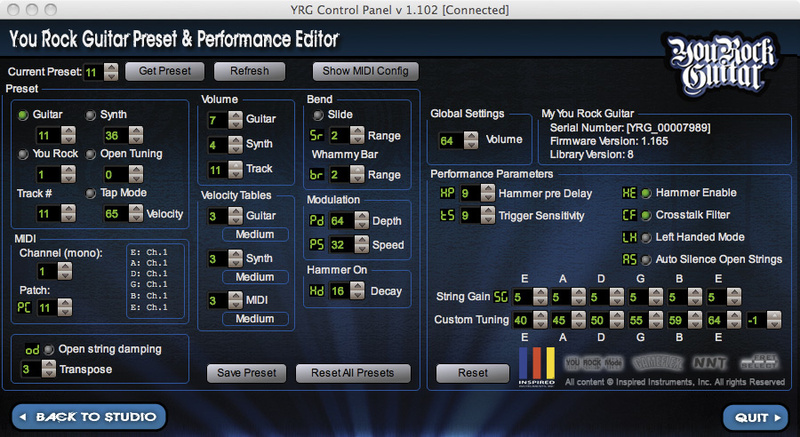 The You Rock Guitar's Control Panel software offers impressively in‑depth editing capabilities. There are two types of MIDI guitarist: one who wants to use the inherent qualities of the guitar in order to play MIDI voices more expressively than a keyboard allows; and the other who simply wants to be able to use software instruments without being able to play keyboards. There are plenty of options for the former, but surprisingly few for the latter, so the You Rock Guitar is a very welcome addition to the market, addressing what I think is potentially the larger group with an affordable, effective solution. The specially coated rubber‑membrane virtual strings actually give a surprisingly guitar‑like tactile response, and most guitar players will be able to get usable results out of it in a matter of minutes, although it obviously requires a bit more of an investment in time and effort to adapt your technique sufficiently to get the best from it. Because it gets the notes out on time, without any pitch‑analysis delay, your MIDI parts will retain the feel with which you actually played them, or you can make good use of quantisation and groove templates, which are often rendered useless on pitch‑to‑MIDI guitar systems by the delay factor varying from note to note. It is not a miracle worker, though, and will not translate guitaristic flavours for which MIDI simply has no vocabulary — attempt to play it just like a guitar and you'll be editing data for days. Treat it like a keyboard, however — a keyboard where the notes are arranged in a guitarist‑friendly pattern — and it will reward you with a considerable expansion of your creative potential. A pitch‑to‑MIDI system still offers more in terms of playing expressive, fluid lines based primarily on bent notes — the YRG can no more do this than any conventional keyboard — but long‑sustain parts like pads and organs work better on the YRG, because you have infinite sustain available, even without using a sustain pedal. There's no actual connection for a sustain pedal, which is perhaps a shame, but if you have a MIDI keyboard in your setup, you can use the sustain pedal connected to that, as most DAWs will aggregate all their MIDI inputs. Using a sustain pedal for held chords means you can take your fingers off and set up for the next chord and thereby create a cleaner transition, but you can always clean up the recorded data afterwards, if necessary, when making awkward changes. Electric piano or chordal synth parts can be very effectively played from the YRG, provided you are prepared to do a bit of editing to clean up a few false and double‑triggered notes — MIDI is unforgiving in this respect and a brief, lightly brushed note that would just be an insignificant low‑level noise on a guitar will be an audible note as far as MIDI is concerned. I find it often pays to leave in really brief 'wrong' notes, provided they are not out of time, and also slurred notes — sliding into the wanted note from the one below or above — as these are often present in real keyboard performances and can add to the realism of the part. Acoustic piano, or at least acoustic piano with any degree of pianistic sensitivity, continues to defeat me on MIDI guitars, YRG included. Maybe it's the strong, unvarying attack of most sampled or synthesized pianos, or maybe I'm just not good enough at it. You can get something usable in the end, by means of a lot of heavy editing, but it's not exactly fun. That aside, everything about the YRG is fun! I really enjoy having access to synth and sampler sounds in a 'language' where I am fluent, as opposed to my rather more limited keyboard fumblings. I love the fact that it is so light and compact that it doesn't even need a strap if you are playing it sitting down; I love the fact that it is so fundamentally uncomplicated that you never have to think more about operating the instrument than the part you are trying to play. The instrument received a significantly useful firmware upgrade during the review cycle, so there is every reason to imagine that my 'wish list' items, such as open‑string‑off, might well be addressed in a future revision. This is the simple, effective controller I wanted when I first started working with MIDI in 1985, but I'm very happy to have it now, and it won't be going back, and wouldn't even at twice the price. The similarly 'stringless' Starr Labs Ztar Z7S (£1396)($2195) is a more sophisticated and significantly more expensive instrument, doing the same job in a different way, but you could argue that it is 'overkill' if you just want to program some MIDI parts in a DAW. The recently discontinued Axon AX100 MkII offered the best in fast pitch‑to‑MIDI, but Roland continue to innovate in the area of synthesis based on actual guitar signals with their COSM products such as VG99 (£821)($1499). Their new GR55 (£509) ($799) looks interesting, too, but in terms of really simple, affordable guitar controllers for basic MIDI programming, the You Rock Guitar is it. There's nothing else. Outputs MIDI note data as fast as a keyboard. Requires relatively little adaptation of technique. Looks like a cheap, plasticky games controller. MIDI output usually requires a bit of cleaning up. 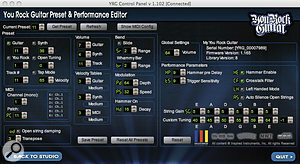 The You Rock Guitar makes an excellent MIDI controller for programming basic parts into a DAW system, allowing guitarists without keyboard skills to enjoy the power of software instruments. Sound Technology +44 1462 480000. Inspired Instruments +1 877 220 3120.